Espanyol vs Valencia – Another home game, another draw. Espanyol served up another excellent high scoring draw at home following on the back of their recent 2-2 draw with Real Sociedad. On Saturday evening, the visitors were Valencia and an open and entertaining game burst into life in the final 10minutes with four goals. Both sides lined up in broad 4-2-3-1 formations. Espanyol opted to use Wakaso instead of Simao on the left wing, other than that, the line up was as expected. Valverde continues to have problems in the centre of defence and the makeshift pairing for this game was Ricardo Costa and Mathieu. Guardado continues at left back and Jonas and Canales were favoured on the wings with Fehgouli remaining on the bench. Despite dominating possession with 57% compared to the home sides’ 43%, Valencia were never really in control of this game. Espanyol were sharper in the first half with Valencia too slow in possession when constructing attacks. There was a lack of dynamism and Soldado never really entered the action as moves broke down in the final third. 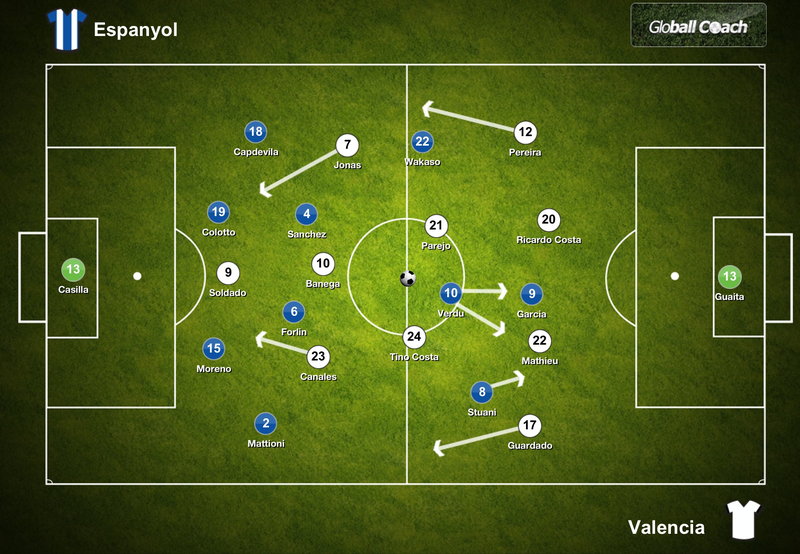 Espanyol were always able to regroup and regain their positions quickly whereas Valencia were slower to do so. A key feature of this Espanyol side is their pressing. They drop off to the halfway line to regain their shape but they can, and do, press high on occasion when they see certain triggers. Dani Parejo was robbed of possession twice when he received the ball facing his own goal. 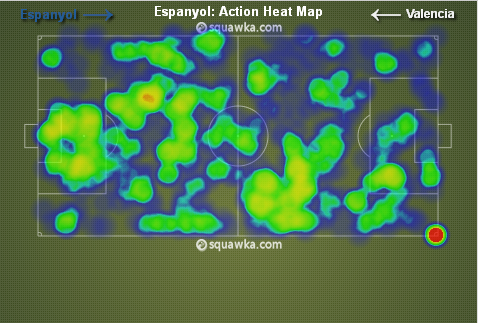 Espanyol knew Valencia would always try to build from the back and targeted when to press for maximum impact. With Stuani being much more attack minded, Aguirre opted to go with the inconsistent but gifted Wakaso on the left. With a higher work ethic and a more industrious nature, Wakaso was able to offer greater security on the left defensively and an edge when attacking. From three attempted tackles, Wakaso was successful with two. This was necessary as Verdu and Garcia moved further to the right to link with Stuani. Espanyol were very reliant upon one side of the pitch for creativity during the game yet their second goal arrived from a breakaway down the left with Wakaso leading the way. The chance appeared to have gone before Verdu volleyed the ball in off the ground. In recent weeks, Jonas has been shifted from his preferred central berth to a wider starting position and operates more like an inverted winger now. Providing width during counter attacks to stretch the opponent, but moving inward when Valencia are building attacks, enabling the full back to move beyond him and provide the width at that point in the move. Despite scoring a goal in the 86th minute, Jonas offered little in the final third with all of his crosses failing to find a team mate. HIs tendency to drift inward also created a problem for Valencia on transitions which Espanyol were able to exploit with Wakaso scoring the opening goal. When an inverted winger moves inward, there is immediately a problem if the move breaks down as the opposing full back or winger is able to progress without restriction. In the 45th minute, Espanyol regained possession in their own half and Verdu released Garcia on the right. His surging run ended with a deep cross to the far post where Wakaso arrived at pace to head the opening goal. Ignoring the poor defending of Joao Pereira, Wakaso was not tracked. Jonas had been central when play broke down and stranded. The positioning of several Valencia players has been a noticeable and intriguing feature of Ernesto Valverde’s time at the club. What may have arisen from emergency situations, appears to have potentially solved some positional concerns. Ever Bangea has been utilised in an advanced central midfield position previously but he often seems uncomfortable there particularly if he is starved of possession. And Valencia can seem bereft of ideas when Banega is deployed so high. The solution has been to use Dani Parejo almost like a deep lying regista, knitting the play together, recycling possession. With Parejo behind him and providing the ball, Banega can create more opportunities for his team mates as he did on Saturday evening. Although he started brightly, Banega was stifled during the first half and only began to have an impact on proceedings when he took up a more advanced position and with Tino Costa off the pitch, the three central midfielders for Valencia had clear duties. Albelda to sit, Parejo to circulate possession and Banega to create scoring chances. Banega played further forward in the second half. More probing. Feeding balls through to the front players. Roberto Soldado became more involved as a result as the Argintenean played a number of slide passes through the Espanyol backline searching for runners coming from a wide to central position. The equalising goal in the 52nd minute came from Baenga’s pass, Canales on an inward diagonal run collecting and dispatching the ball home. Soldado saw his 78th minute effort saved after receiving Banega’s through ball but Valencia’s top goalscorer was not to be denied and latched onto another pass from Banega in the 90th minute to give the away side a temporary lead. Again, the run from from a wide starting position into the channel between full back and centre back. 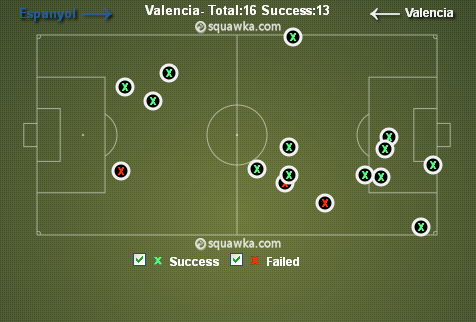 An area Valencia sought to expose in the second half. Whilst Banega represents a change at the front of the side, a change at the back has been equally good although on side evening, Victor Ruiz reverted to type. Ruiz returned to the first team following a month out trough injury when he was called into action following the removal of Ricardo Costa due to injury. Following the arrival of Valverde and the poor form of Fernando Gago in the defensive midfield position, Ruiz was moved into a deep midfield slot as a temporary measure. It’s an area where he has shown a considerable improvement in his form and crucially, where any mistakes he makes are not subject to harsh punishment. Statistically, Ruiz performance was fine. He was not hitting stray passing, mistiming tackles, failing to win headers or conceding fouls. But it’s the things that cannot be measured that have caused Ruiz problems. The poor decision making and lapses in concentration. On Saturday evening, the thought process behind Valverde’s decision was brought sharply into focus. Arriving as first half substitute, Ruiz somehow escaped the concession of a penalty from a reckless challenge on Sergio Garcia in the penalty area. It was a challenge that did not have to be made yet Ruiz launched himself into it. And in the final minute of the game, Ruiz failed to deal with a ball headed into the penalty area. The defender tried to shepherd the ball back to Guaita in goal rather than undertake the basics. Your side is winning 3-2 away from home and the game is deep in injury time. Clear your lines. Conceded a throw in or a corner kick if necessary. Ruiz did neither and he was unsuccessful holding Garcia off and Espanyol promptly equalised. Javier Aguirre has led Espanyol to five home wins and four draws during his brief tenure at the club. As well as Espanyol are doing, Aguirre must now let his focus shift to next season. Can Garcia continue to deliver as he enters the last few seasons of his career? And will Verdu still be at the club next season? These are the dilemmas which should now occupy the Mexican’s mind. Given the run of form Espanyol are on, a point is a decent result for Valverde and his men. Until that is, La Real secured 3 points away to Rayo. It leaves the gap between La Real and Los Che at 4 points. Valencia now face two games which could define their season. Malaga travel to the Mestalla this weekend followed by Los Che making the trip north to San Sebastian where La Real lie in wait. Secure maximum points and the coveted 4th position will still be within touching distance.